I had no hits when searching for "titchy" here, so I thought I'd mention it exists. It is a debian arm system that comes with very nice instructions and an installer. Those looking for native debian on the Z, this seems to be it. Anybody know a good way to dual-boot this? Would installing it, then installing uBoot, then installing r198 work (if you held down whatever key on a reboot)? Nice! Thanks for bringing this up!! 1) What kind of packages does this debian take? EABI or the ordinary ARM? 2) Any toolchain for compiling stuff? Wow...That didn't take long...I already broke down and am installing it on my Z ASAP! Looking forwarding to your hands-on report! Hmm...It fails loading the installer components from the "CD" any thoughts? I'll try recopying it, but other thoughts are welcome. They talk about this in the "comments" section of the site. I didn't have this problem, but I used the netinst cd image. I thought this could help me with dhcp, but that was a no go. Once I entered the config manually, everything went smoothly. It is not eabi, and it uses etch as default. I saw dj0 is running lenny, but I don't know how he did it. Abiword - firefox - evolution - gnumeric - gpe-contacts - gpe-todo - dillo - nano - leafpad - xfce - gdm - ... : everything works. It gave an input/output error...Switching VTs and remounting the SD card seems to make it work. Going (slowly) on. So it uses the official ARM packages, is that right? Then there should be a GCC toolchain? Do networking, screen rotation and over/under-clocking work? I suppose the silkscreen keys don't work, do they? Sorry one more: how can the system upgrade? The installer screen is rotated, which is irritating. It appears it is normal normally, though. Yes, it uses the normal Debian-ARM packages, and AFAIK there is a toolchain. If there isn't, I'll be switching back mighty quick. As for the SD reading issues I was having, it's probably due to my not properly unmounting my card from my laptop after the driver went haywire. Great! I am also going to try this out once my 3200 finishes compiling Evolution for OpenBSD 4.2 (main package done, just a few dependent packges left...). If there is a native toolchain, then now Z has both Debian and OpenBSD as the *standard* distros. Isn't it cool? I agree, it is awesome. I'm looking forward to having the same OS on my Zaurus as I do on my other computers. On a different note, I REALLY wish I hadn't accidentally started the install from a mirror instead of the CD. It's taking forever! EDIT: Chero, is the X server the full Xorg, or is it kdrive/some other stripped down X server? Can titchy be modified to allow installation to a SD card for C1000s? Ordinary arm. But the guy who set this up seems to be thinking about armel for the future. gcc? You mean something like bitbake (which I never could get to install), no. All this is is the kernel, x server, enough utilities to get going, and then you go find your nearest debian mirror. Simple as that, and it all works. I don't know whether titchy deserves the credit for this, but wifi works so much better on this than with anything else I have used on my zaurus, it's amazing. It just works. Put it to sleep, wake it up, and it sniffs out the network again and sets it up. With Angstrom, I had to re-run ifup wlan0 each time it woke up. But it could be worse, with OZ I had to re-boot. Same card, same machine. This is the only distribution for the Z3100 that will let me do what I want, and use this as a --- computer. It has gcc -- it has debian, which has gcc if'n you want it. Networking works like a charm. I had trouble after installation, since I had two competing sets of modules, one which would not work with my network card. Once I figured out which one to blacklist, I was in business. Wired ethernet works, too. I have not tried usb networking, so can't say about that. Screen rotation does not work. Neither does over/under clocking, but someone is talking about a new kernel that supports it. Silkscreen keys don't work, but keylaunch will work for the special buttons on the bottom, and that also allows you to use xloadmap to change "mouse buttons" for touchscreen taps. I upgraded the system from debian etch to debian lenny by changing the entries in /etc/apt/sources.list (just as you would for any debian), and ran apt-get update; apt-get dist-upgrade. The only thing that broke was the link to the X server (one of my installation steps loaded the xorg server, which is not configured right and you don't want anyway, and the upgrade re-links X to that; a simple linke back to the kdrive server fixes that. BTW, it is a bit slow to upgrade all that. I even changed the wm on my desktop machines (they used Gnome before, a bit much on a Zaurus) to xfce4 -- so they are all the same. PIM: You get xfce4's minimalist calendar orage, which is OK, as well as gpe-contacts. You could get a sid version of gpe-calendar, but with them changing, incompatibly, calendar formats with each new version, I don't recommend it. With a powered usb hub, I can use a mouse (but I have to hold it sideways...), usb storage, and printer (cups worked no problem). It really gives you whatever you can find in debian. I have not yet found a package that did not work. "Neil" -- whoever he is, he's the guy behind this -- says he can't, but it might be possible with some work. Of course, since installation requires a network connection, and you need the cf slot for that, and you need the sd slot to flash and start the initial install, it may not be possible since you don't have a free card slot. The kernel won't support the usb without modules, but maybe the 1000 has enough internal storage to hold the base system? I've been using this for a week now, and love it. It is real debian, and I have yet to have a problem besides speed issues. These machines are not all that fast, after all, and some things take a long time to load. Printing with lyx took a long time the first time since metafont and all that was running in the background. But I am spending the Spring on sabbatical in Spain, and now I can take my Z as my only computer, and still manage to work. It has everything that debian has, since that is what it is. I'm glad to see someone else notice this. A few questions, if you don't mind? I'm having trouble too-- my internal cf replacement seems to format, but is causing a kernel panic. i have no wifi / LAN card installed right now and is there any work around to mount the debootstrap on the dists/etch/.../Release on the faked cdrom? since after browsing several debian help in the web, I think the problem is dealing with that. You need a network connection to install it. I had the error when my LAN wasn't configured properly. Bluez, gnome-bluetooth, gnokii, wammu, ... They are all in the feeds, but I haven't tested them yet. I have no trouble with the SD, I can mount it just fine. Udev : not tested yet. It can help to check the "comments" section of the homepage, some issues have been solved already. I have to start working now, will try to do some more testing this evening. Hmm. udev is installed without problem in my case. Base system installs smoothly. Wireless networking (w/ 128-bit WEP) works like a charm. I tried two of my SD cards. The first one seems to be corrupted and the CD image was not extracted completely. Then I switched to another SD and everything was fine. Hmm...I will try again later. It's probably my LAN. Debian got installed on my 3200! From the "Comments" section in the wiki, neil says it depends on GAIM, Sylpheed, etc., and uninstalling these programs will also uninstall titchy. Tip : If you want the latest and the greatest, first do an apt-get dist-upgrade. (the more packages that are installed, the longer this will take). I'm planning on doing this since some packages in etch are quite outdated. Can you (or anyone here) elaborate on the last part? How can we fix the X server precisely? Okay, a screenshot of Iceweasel (= Firefox 2.0.0.6)! iceweasel installs in just 2 minutes, including all the dependencies! iceweasel starts in 1.5 minute! I think maybe the device that wasn't being read on my unsuccesful tries was the debian.iso Mine was 27 megs. What size is the one you used to get ths working? It's the business card arm image, 22.7MB. will try now so I can post error. Anyone have any idea how to fix this? My worst-cse scenario is r=to pull the CF and pop in a 6gb microdrive (I already have one), but it seeems like this shouldn't be be necessary. Is this a problem with the formatting script in the loader? edit: incidentally, how is the speed compared with pdax? I am also using a swapped-in 16gb CF, but I didn't encountered the kernel panic problem. How about doing a fdisk first in the emergency mode, and then try to install debian again? And using another card with another CD image download? Speedwise, Debian is quite satisfactory. I remember Firefox under pdaX (Beta 3) starts in about 2 minutes, at least not faster than running iceweasel under Debian. I agree about using a differnt sd and download-- You mean "hd clear" in the D+M emergency menus? will do. won't be able to try another card for a few hours, though-- If I even have a more suitable one laying about. the one I'm using is a Lexar 1gig SD--it seems ok, but that is often illusory. Not D+M, but D+B emergency mode. And I checked /etc/X11/X. X is already linked to /opt/kdrive/X, and not xorg as dlj0 described in an earlier post. But X still fails to load. startx stops without loading any desktop loaded. BTW : running dist-upgrade now - will see where it leads me. I guess i found one cause of the problem I'm running into: It seems the upgrade (including some X stuff) had not finished yet even though xfce4 loaded again (by itself). I noticed the hdd light kept flashing when I started playing with the new environment. So i gotta use some patience during upgrading and shouldn't be over-excited. I'll see if I can do without xdm or gdm, as I find the system sometimes inconvenient to be forced to boot into X all the time. Now I am thrilled to taste how Debian rocks as an *authentic* distro on Z. EABI will surely make things even better! My suspicion is confirmed. After waiting for the whole upgrading process to finish (which took quite a while), simply startx brings me back to xfce4, without startxfce4, xdm or gdm... No tweak is necessary. Nice. It seems dlj0 has already fixed the X issue found in upgrading to Lenny earlier on. How to do mouse right-click as in pdaX? Fn+click doesn't work as assumed. Is there anywhere I can set in xfce4? At the same time I also hope OpenBSD has got SD write and bluetooth working really soon, so that users can enjoy the very best of both Linux and BSD. I suppose the internal CF (mine Sandisk Extreme III) also does the trick here. Will try hdparm test later (thanks adf for the tip) and post the result in another place. Sounds great! I'll be testing soon if the install works. I formatted/wiped everything (including the MD), so there shouldn't be anything wrong. 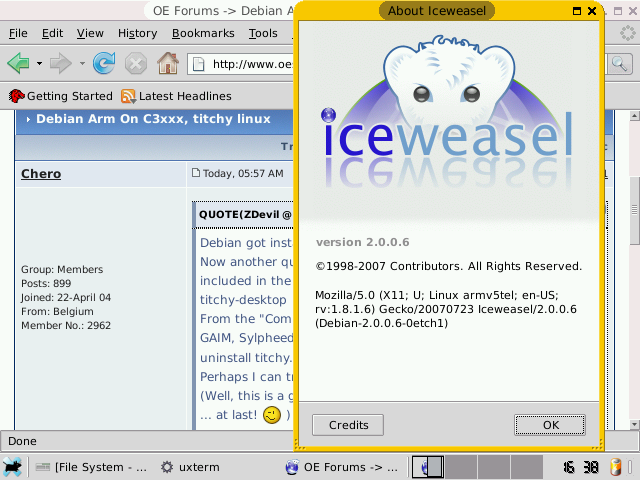 How's IceWeasel work? Faster than in pdaX? How about Galeon (lightweight gecko-based browser)? I installed etch, then edited my sources.list file to say "testing" instead of "stable" or "etch (keep the security update site as stable), and then apt-get update, apt-get dist-upgrade. It took several hours, since I had a lot loaded. key=. *.1:xmodmap -e "pointer = 1 2 3 "
key=. *.2:xmodmap -e "pointer = 2 3 41"
key=. *.3:xmodmap -e "pointer = 3 4 1"
To get a button-2 click with the touchscreen, hit Ctrl-2. Then, all mouse clicks will be center button. To return to button 1, hit Ctrl-1. By default, either the Fn key or the Alt key should give you button three when you click --- but I find that it is not consistent.